Pack your bags and come to a week long or weekend summer camp getaway just for women. Time to breakaway from the chaos, alarms, cellphones & schedules. Our cozy little cabins are nestled in the woods on the grounds at Central Oak Heights in West Milton, PA: in the beautiful Susquehanna River Valley. This camp is for women to relax, refresh, rejuvenate, rediscover themselves. Swimming, aquasize, great food, workshops & guest speakers to inspire you and encourage your creativity. A drumming circle this year. Games, music,entertainment, campfires & smores... Massage and Reiki treatments available by appointment. Outdoor Sunday service. Reunite with the girl inside and have some fun! Camp Ladybug for Women is a short sweet vacay packed with lovely caring women keen on exploring their dreams. Terry Stahley, Camp director, has developed grand programming that offers a variety of great fun that we can choose to participate in ...or Not. There is no pressure to do something you don't want to do...and often there are multiple activities to choose from. THE FOOD is awesome and plentiful. Central Oak Heights is the location for Camp Ladybug...a grand centrally located facility http://www.centraloakheights.org/ that offers the public a wonderful facility for summertime activities. 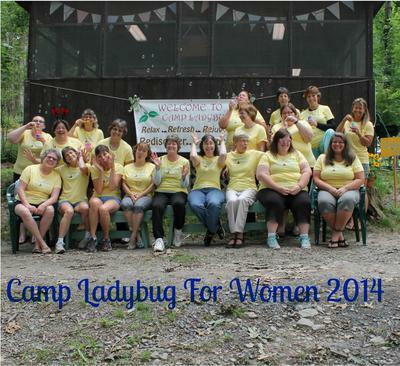 Join the ladies at Camp Ladybug this summer and meet your new best friends.